After being diagnosed with a chest wall sarcoma, a 54-year-old Spanish man’s surgical team made the decision to remove his sternum and a portion of his rib cage and replace it with an implant. The implant was designed and manufactured by medical device company, Anatomics, who utilized the CSIRO’s 3D printing facility, Lab 22 in Melbourne, Australia. The surgical team, Dr José Aranda, Dr Marcelo Jimene and Dr Gonzalo Varela from Salamanca University Hospital, knew the surgery would be difficult due to the complicated geometries involved in the chest cavity. The procedure has been described in the European Journal of Cardio-Thoracic Surgery. That’s when the surgeons turned to Anatomics. After assessing the complexity of the requirements, Anatomics CEO Andrew Batty said the solution lay in metallic 3D printing. 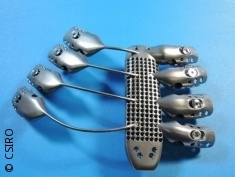 „We wanted to 3D print the implant from titanium because of its complex geometry and design,” he said. Through high resolution CT data, the Anatomics team was able to create a 3D reconstruction of the chest wall and tumor, allowing the surgeons to plan and accurately define resection margins. „From this, we were able to design an implant with a rigid sternal core and semi-flexible titanium rods to act as prosthetic ribs attached to the sternum,” Batty said. Working with experts at CSIRO’s 3D printing facility Lab 22, the team then manufactured the implant out of surgical grade titanium alloy. „We built the implant using our $1.3 million Arcam printer,” Alex Kingsbury from CSIRO’s manufacturing team said.